When I moved into my first apartment, I was excited to be able to decorate exactly how I wanted my place to look. My studio apartment was decorated in everything Paris & Eiffel Tower. The bathroom was decked out in London decorations. As I continued to move into 5 places (yes 5!!) over the last 3 years (even crazier) my Paris obsession continued. In every place I lived, I have always hung my favorite picture of a city view of Paris with the Eiffel Tower lit up in the background. My place is filled with travel books, world maps and globes. At work, my office “theme” is travel. I have a picture of the Eiffel Tower, world maps, globes and trinkets from places I have visited. 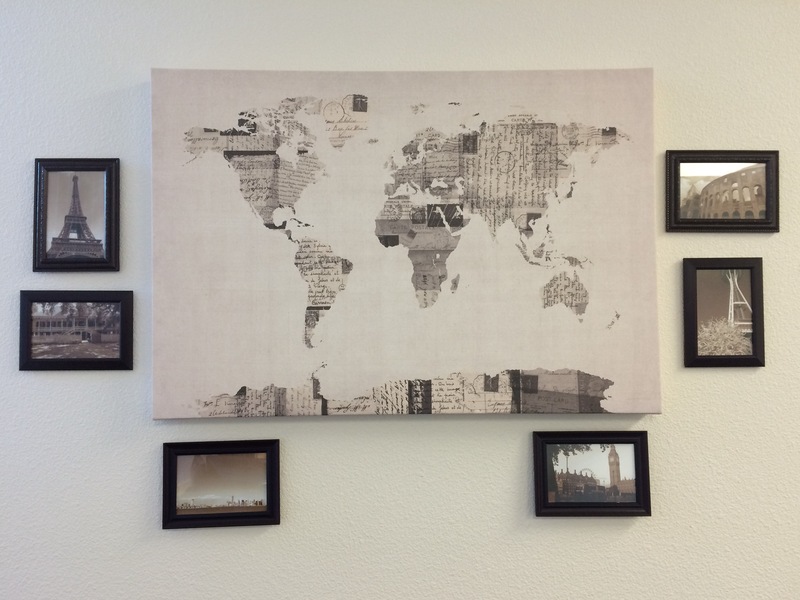 My favorite office feature is a map display with one picture from each of the places I have visited around the world. 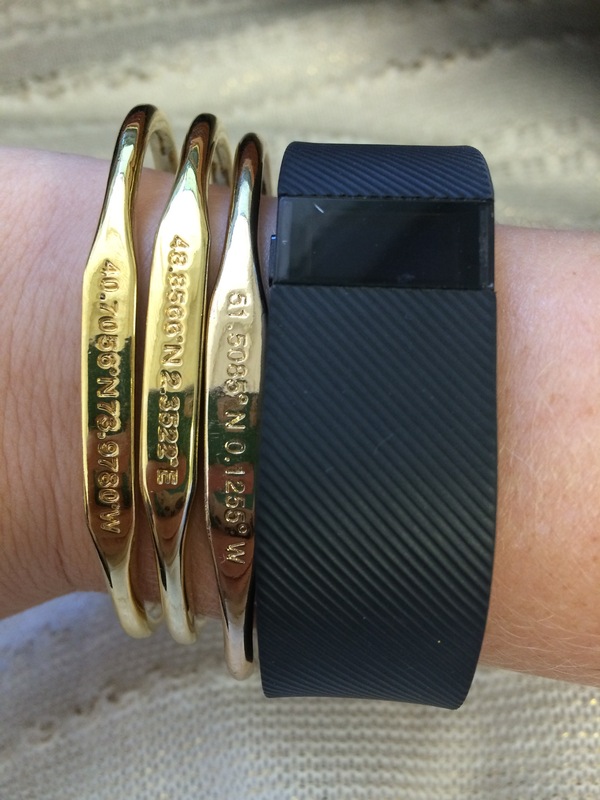 On Instagram, I posted the jewelry I am wearing today which are bracelets with the coordinates to my three favorite places I have visited so far (Paris, London & New York). Needless to say, I make sure travel is all around me in my everyday life. Growing up, my family never traveled out of the country and I did not have friends who shared grand tales of traveling to inspire me. Yet for some reason in my teenage years, I grew this strong desire to travel. First on my list of places I had to see was Paris, France. I could not tell you why I grew an obsession with the city but it continued to grow into my 20s. When I first heard the word wanderlust, I realized I had found the word to describe the feeling I had about traveling the world. At age 25, I finally got my first passport and made it to the city I had waited years to see. I thought finally traveling to Paris as well as other countries would cure my wanderlust or it would at least subside. Oh how I was wrong! As usual, my mother and husband will be the first to tell you, quite the opposite has happened. With each place I visit around the world, my desire grows stronger to visit more places. As places get crossed off on my Travel List, the list continues to grow as I add more places I want to experience. While having the constant desire to travel anywhere I can is definitely an expensive habit, it is worth it. My wanderlust has made me not only work harder but appreciate the work I do because it allows me to travel. Being fortunate to have a job that has vacation makes me appreciate much more when I am home. Yet when I am traveling the world, whether staying domestic or crossing the pond, I am appreciative of everything I am able to see and experience. Tell me: Do you have wanderlust? Do you have one place you have dreamt of visiting your whole life? This entry was posted in Travel, Travel List, Wanderlust and tagged Travel, Travel List, Wanderlust. Bookmark the permalink.